It's been a while since I've posted a recipe, so considering the circumstances of this meal were a little unusual and the reviews from this single father's children were so positive, I thought this would be a fine choice. If you've followed me on Facebook or Twitter, or if you're a regular reader of "The Single Father's Guide Blog," you already know, during essentially the entire month of April, I had my kitchen remodeled. Prior to this project, the biggest remodeling job I'd ever undertaken was a master bathroom in my first house, a Cape Cod-style home in Harrisville, Rhode Island circa 1994. A kitchen is an entirely different thing. With the kitchen out-of-service, we survived with paper plates and plastic-ware in what had been the dining room where I'd moved the center leafless kitchen table, a soon-to-be-replaced refrigerator, microwave, blender, and, of course, coffee maker. I limped along with a small fraction of my cookware, which I stored in a 1940's era mahogany sideboard/buffet along dry and canned goods. (The sideboard, as a side note, is a little worse for the wear.) We washed the non-disposable dishes in the bathroom sink, which I needed to pay special attention to clean and disinfect. When I brought home a couple of boxes of mac 'n' cheese from the grocery store, The First Beautiful Daughter asked, incredulous and sarcastic, "How do you plan to cook that?" I have only one side burner on my Ducane Grill, so the Italian had to be cooked on the grate. With my trusty friend, my Ducane Grill, which recently celebrated its 16th birthday, I intrepidly started to cook what I called . . . In a pan, brown Italian sausage. 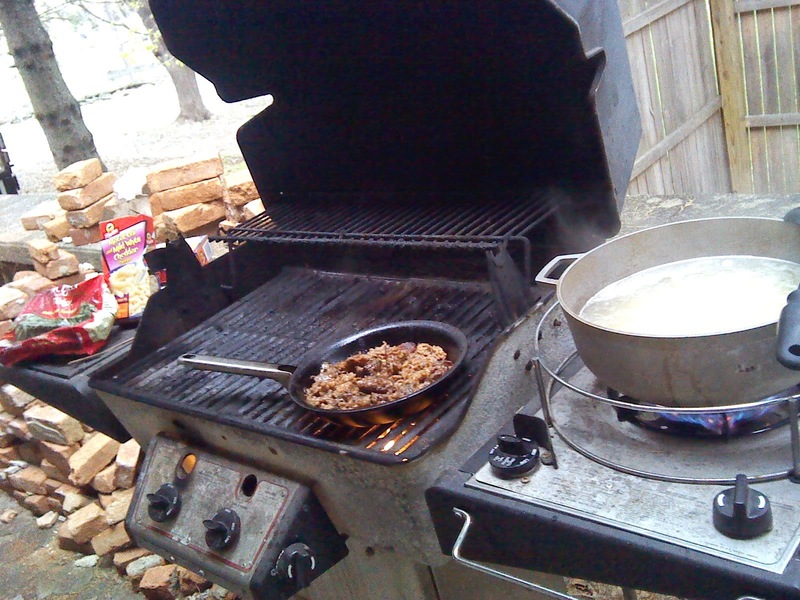 In a large pot, bring water and salt to a boil and add two boxes of macaroni and let cook for about five minutes. Add frozen spinach to the pot and allow to cook for another five minutes. Drain. 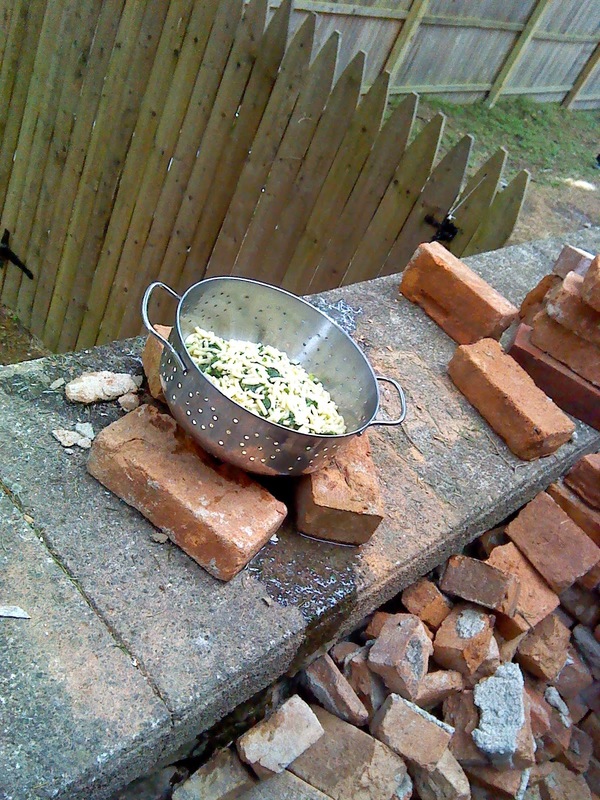 While macaroni and spinach are ﻿﻿﻿﻿draining, add milk, cheese packets, and six slices of American cheese to empty pot. Stir while allowing to warm until cheese is melted. Stir-in browned Italian sausage along with some of the grease. 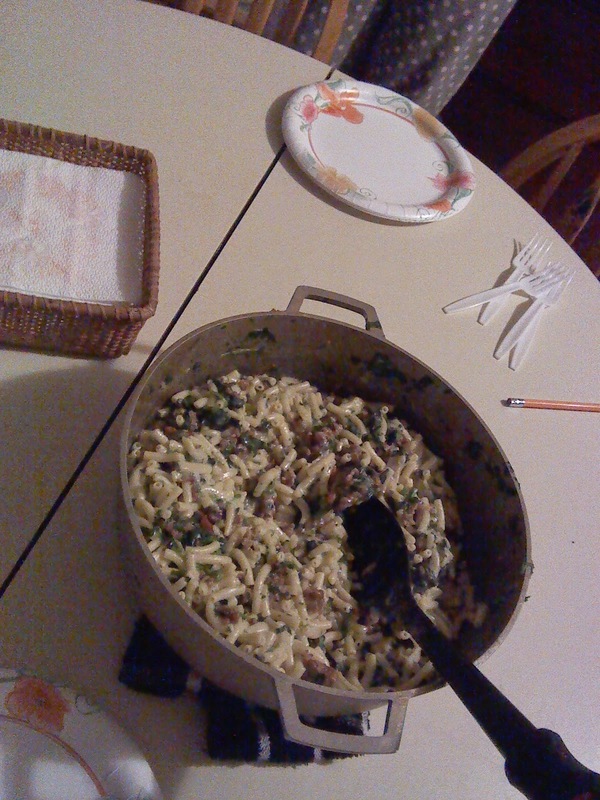 Stir in drained macaroni and spinach. ﻿﻿﻿﻿﻿﻿Okay, I won't get into the nutritional values of the Italian Wedding Mac 'n' Cheese a la Dad because, frankly, it's a little below my standard healthy food threshold. The macaroni is high in carbohydrates, the powdered cheese in the macaroni box is highly processed, and there is more fat than I'd like to have in the sausage and processed American cheese singles. Still, it does check the box for my rule of including a fruit or vegetable with every meal and it does hit the four food groups I also like the high iron content, which is important for everyone, but particularly for my young women. Straying from a skinless chicken or fish entrée with healthy vegetable and no starch dinner is not such a bad thing once in a while, right? Everyone had seconds and The Second Beautiful Daughter even complimented me with, "Hey, Dad. This is pretty good." That's the equivalent of a Zagat rating of 30.